Hebrews 5-9 is about Jesus, our High Priest. He is our mediator, always interceding for us. He is our connection to God. He died for us. He lives forever. He is all we need, and we are now called to live that way. The Hebrews need to reconcile their Old Testament Laws with the new life we all have in Christ. I think the most important part of the verse above is to note that Jesus is "able to save completely." But, here's something I've learned from my own life. I took for granted (for way too long) Jesus' saving grace and neglected my own role in my relationship with Him. I was so distracted at times, convinced that I could and should handle things on my own in order to be successful, that I was missing out on my Savior's power to save me "completely." 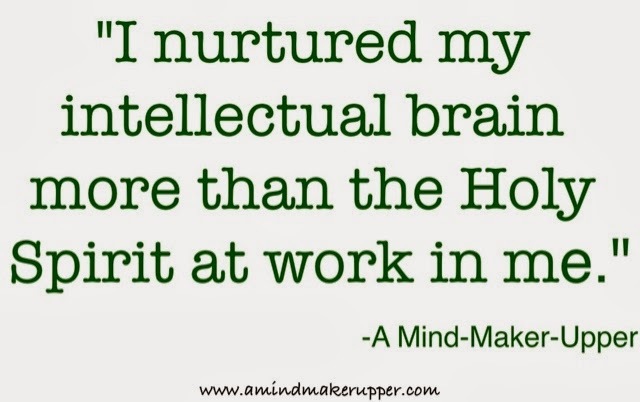 I nurtured my intellectual brain more than the Holy Spirit at work in me. If you've ever fallen into this rut (sometimes I still do), you probably also know how exhausting it is, how stressful, how frustrating, how overwhelming it can be. Most of all, you eventually realize, with many major crash and burn episodes, how inadequate this way of living turns out to be. Like the Hebrews in today's reading, I wasn't realizing the full potential of my faith in Christ. In my case, I turned to God for the "big things," the crisis moments, when He literally stopped me in my tracks. But when it came to the little things, my day to day routines, decisions, and choices, I relied on myself. I don't know when I changed. It was a gradual transformation that came from a slow process of letting go. But, I do know why and how I changed. I had an unavoidable need for a better life, a more certain life, an abundant life. I craved joy that didn't fly up and down with my roller coaster circumstances. I admitted that even though I could handle the little day to day things on my own, I didn't want to anymore because God always knows better than I do. So, I started turning to God, relying on Him, for everything. What a difference He makes! God is my all-powerful, all-knowing, loving, ever-present, mighty Counselor. He gives me Jesus, Immanuel. God is with me. That's the best gift I will ever get. Thank you for loving me, and for sending Jesus to save me completely. Forgive me for trying to do things on my own. 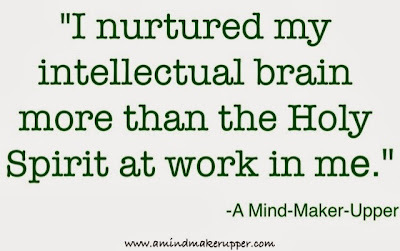 Forgive me for letting my own thoughts get in the way of Your Holy Spirit at work in me. Help me to seek You, hear You, and find You in all that I do. I pray You will be with ___________ today and fill him/her/them with Your comfort and joy that surpasses circumstance.